This video details how to add and georeference an AutoCAD drawing file for a HEC‑RAS model. There are two ways of adding an AutoCAD drawing file, as described below. If just starting out a project, the AutoCAD drawing file can be directly loaded. 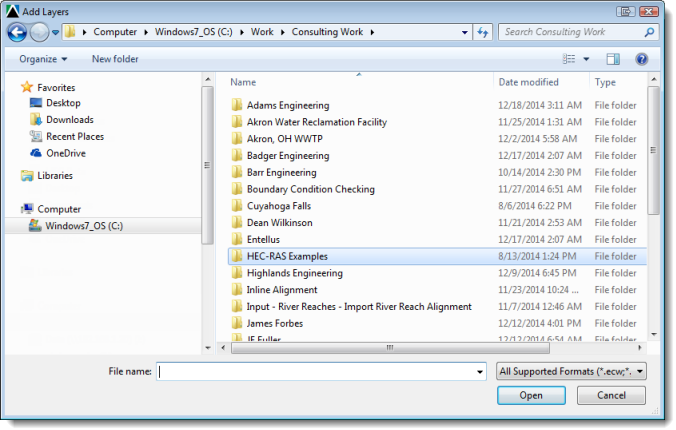 Select File | Open and then select the AutoCAD drawing file to open. However, this method cannot be used for a project that already contains data. For these situations, follow the steps discussed in the following section. 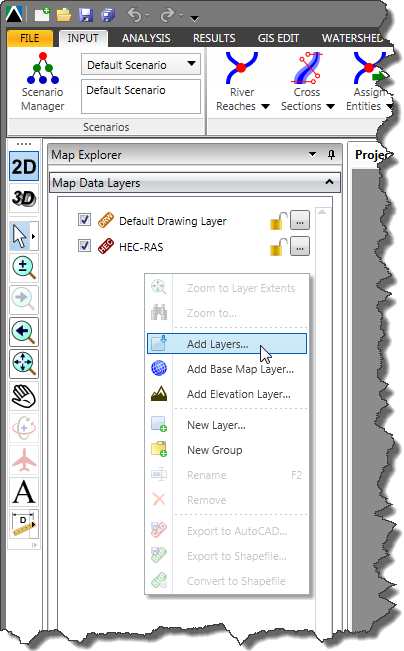 Right-click on the Map Data Layer panel and then select Add Layers from the displayed context menu. The Add Layers dialog box will appear. Select the AutoCAD drawing file to load. The selected AutoCAD drawing file will be loaded into the Map View and Map Data Layers panel. If the imported AutoCAD drawing file does not have an assigned coordinate reference system (CRS), see this section on how to georeference the AutoCAD drawing file to the Map View. AutoCAD drawing files can also be dragged and dropped from Windows Explorer onto the Map View or Map Data Layers panel. Dropping the AutoCAD drawing files onto the Map Data Layers panel provides more control on the display order of the selected AutoCAD drawing files. How to Add a GIS Shapefile to a HEC-RAS Model? How to Export a HEC-RAS Model?